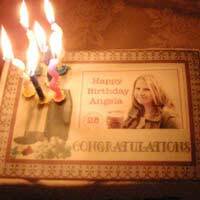 Adding pictures to birthday cakes is relatively simple to do. You actually have two options – you can call a local bakery and ask if they do a picture service, or you can buy the supplies and do it yourself. If you want to learn how to put pictures on birthday cakes – you can by following the simple instructions below. Cake– Any flavour, type, shape or size will do, but obviously it will have to be big enough to accommodate the photograph that you choose. You can bake the cake yourself or buy one ready-made. Rice paper sheets – Rice paper is edible “paper” which you will be using to draw the pattern on. Icing – you can make your own icing and add natural colourings, or you can buy coloured icing from a cake makers or a supermarket. Pastry/pipe bags – you can use these to apply the icing to the rice paper. Make sure to buy different sized tips (smooth and star shaped) for the pastry bag to ensure the right amount of icing. The cake you have chosen needs to be iced before the picture is added. You can do this yourself or buy a birthday cake that is already iced. However, if buying a cake, make sure that there is room for the picture to be added, and that the icing is fairly plain. Using the crayon, trace the picture onto the rice paper. This is done simply by putting the rice paper over the chosen picture and drawing what you see. Rice paper is very thin, so you shouldn't have difficulties tracing the picture. Once the picture has been traced onto the rice paper, cut it out and add it to the top of the birthday cake. The rice paper should dissolve, leaving the picture on the cake, but don’t worry if the rice paper doesn’t dissolve, as it is edible. Fill your pastry bag, either with homemade icing or ready-made icing, and start to trace the edges of the picture. A dark coloured icing works best for the outline of the picture as it helps the picture to stand out more. If you struggle to find a premade icing in a dark colour, try using fudge icing instead - this works just as well for an outline. After you have completed the outline, the next step is to fill in the rest of the design. It is generally easier to start with the smallest areas first that require more of a steady hand. Fill in the colours with a star shaped nozzle for the pipe bag. You may find you end up going over the original outline; don’t worry if this does happen, you will be doing the outline again in the next step. Once you have finished filling in the picture for the birthday cake, go over the outline again with your dark icing. This will really bring the picture to life and add the final touches. You should now have a birthday cake that has an amazing picture on it. And, the best thing is you did it all yourself! Picture birthday cakes add a little something special to a birthday party – you could have everybody asking where you bought the picture birthday cake from – imagine their surprise when you tell them you did it all by yourself!